Eastern Wood Pewee perching on a log. The eastern wood-pewee is a medium-sized flycatcher growing to about 15 cm long. Like all pewees, they stand notably upright; have short legs, and a crown which gives their head a triangular appearance. Long wings and tails characterize them from other similar species. Adult males and females are similar in appearance with greyish-olive on their upper body, pale colouration on their throat and belly, and thin, pale bars on their wings. The underside of the bill is mostly yellow-orange, with the exception of some juveniles. Largely an inconspicuous bird, the eastern wood-pewee will grab your attention when it opens its bill and gives its unmistakable slurred call: pee-a-wee! Mostly small, flying insects and therefore will seldom visit bird feeders. When multiple species of flycatchers (birds that eat flying insects) live in the same forest, they each find their niche. The eastern wood-pewee tends to forage higher in the trees than some flycatchers, but lower than others. Its diet includes flies, bugs, butterflies, moths, bees, wasps, beetles, grasshoppers, crickets, stoneflies, and mayflies. The pewee also eats small amounts of vegetable matter, including the berries and seeds of dogwood, blueberry, raspberry, and poison ivy. 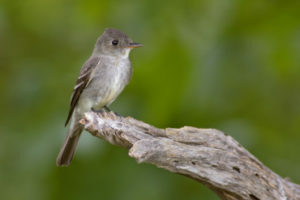 The eastern wood-pewee lays 2-4 white or cream coloured eggs in a small nest made from wool, bark strips, twigs, roots, mosses, pine needles, or leaves which are covered with lichen. Nests are so well camouflaged they often look like a knot on a branch. The breeding ranges of the eastern and western wood-pewee overlap in a small region in the American Great Plains, but the two species do not appear to interbreed. Often found perched on dead branches in the mid-canopy where it searches for flying insects. Lives beside forest clearings and edges of deciduous and mixed forests. It is most abundant in intermediate-age mature forest stands with little understory vegetation. The eastern wood-pewee has experienced population declines over the past 40 years in Canada and the United States. Shade grown coffee presents a tremendous opportunity for both conservation and economic gain for South American farmers.  Coffee grown under the forest canopy can provide our migratory birds with a safe refuge. Please purchase shade grown, preferably organic coffee. Choose Forest Stewardship Council certified (FSC) wood products. If possible, leave dead wood standing on your property to attract insects.